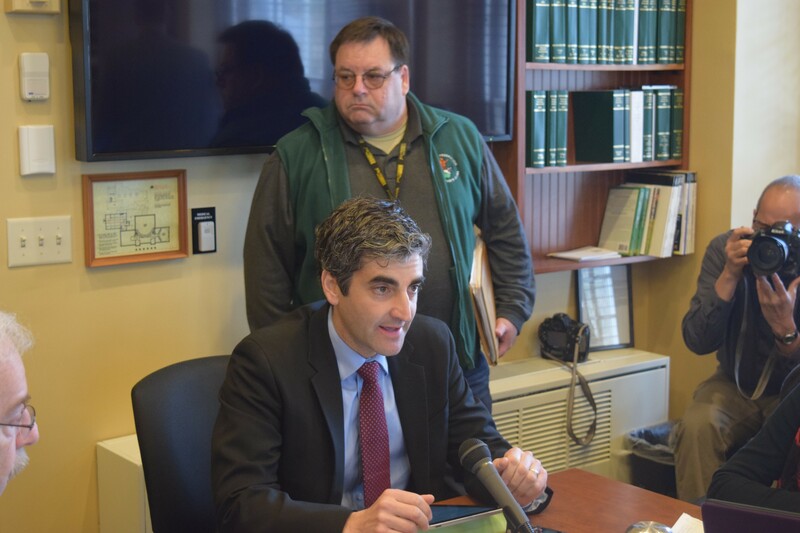 Burlington Mayor Miro Weinberger urges the House Government Operations Committee on Thursday to pass three gun restrictions that city voters backed. A House committee on Thursday smacked down three gun-safety measures that Burlington voters overwhelmingly backed in 2014. Legislators seized on that as a reason not to launch into what surely would have been a controversial discussion. Lawmakers had just finished a difficult debate in passing gun-control legislation to restrict possession of firearms by felons and the severely mentally ill.
“I think Burlington needs to re-craft these if that’s what they really want,” said Rep. Linda Martin (D-Wolcott). Rep. Joanna Cole (D-Burlington) was the sole committee member who wanted the legislature to work with Burlington to finesse the wording and act on the package. Burlington voters sought three measures for the city: to allow police to confiscate weapons from suspected domestic abusers, to prohibit guns on the grounds of bars and to require guns to be stored in locked containers. Fitzpatrick warned the committee that the measures would surely be challenged in court. He said that the results would be difficult to predict, but that recent court rulings suggest challenges might be legitimate. A federal court last year ruled on a Baton Rouge, La., ordinance similar to Burlington’s proposal to ban guns on the grounds of establishments with a liquor license. The Louisiana court found that the ordinance was overly broad by barring possession of a gun in a parking lot. Eileen Blackwood, the Burlington city attorney who helped write the charter changes, listened Thursday as Fitzpatrick critiqued her work. She said afterward she was aware of the legal perils he laid out, but she believes the measures are legally defensible. “We were hoping that Vermont would step up and be willing to be part of looking at these laws,” Blackwood said. Ed Cutler, president of Gun Owners of Vermont, said that his group had been preparing to challenge the Burlington charter changes in court, had they passed. “I’m glad they understood that every one of those ordinances would be overturned,” he said.